Our expert consultants can guide you in getting the most out of QuickBooks. Here at Ken Harris & Associates, we offer QuickBooks consulting services. Our experts excel in identifying and recommending the best software solutions for you, the client. We provide an exceptional level of service with our resources and our support for your business and you. We offer incomparable customer service and guidance to help you select, customize, and implement the best solutions for you and your business. 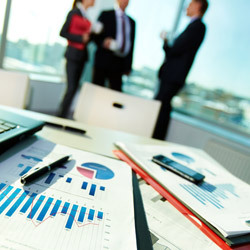 No matter if you are just starting off, or if you need to establish more advanced financial procedures and controls due to your business’ ongoing success and expansion, our qualified QuickBooks consultants can work with you to develop and implement very useful accounting solutions that are specific to your business and industry. Before these improvements are discussed and applied, our expert advisors will review and analyze your current bookkeeping method and system in order to identify any and all improvements that need to be made to increase your business’ efficiency and profitability. We can also consult with your staff to ensure that your team completely understands the appropriate procedures and accounting methods when using QuickBooks, as well as the complete functionality and features of your accounting system.